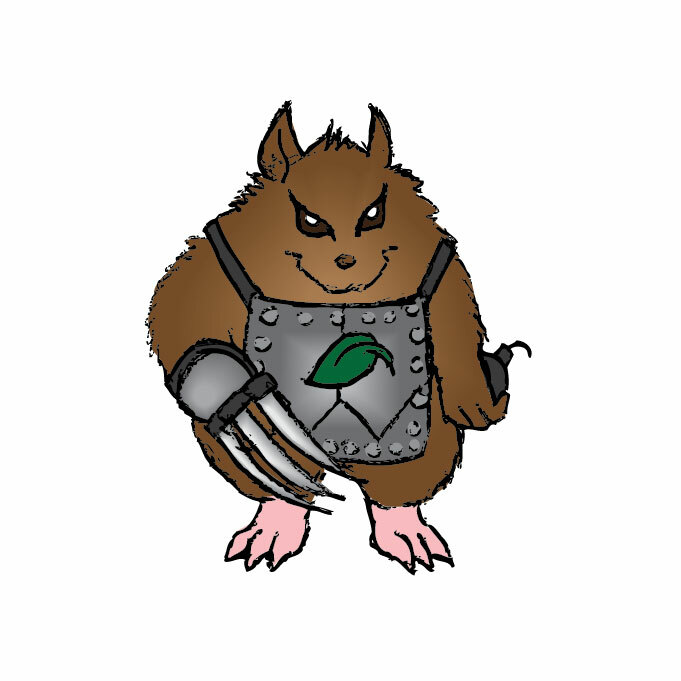 Michtims are easily mistaken for hamsters at first glance, yet they have access to magic, technology and nature's allies. They are in constant struggle with human's plans to take down their sacred Immergrummel woods. Nevertheless, they also know how to have a good time, because bakery festivals are an important part of their culture. The core rules are taught in steps. The game is playable with just the basic rules (that are also reproduced on the character sheet for your convenience). If the Michtims grow experienced enough, the game master will introduce Callings and Gear to offer more complexity. Players are able to create new material, based on the existing framework or change the fiction aspect of established content. Michtims are very emotional. Their abilities are directly based on five emotions. Anger is used to attack foes, while Love allows the Michtim to tend the wounds of friends. Joy provides mobility and perception, while Fear is used to hide or evade attacks. Grief, on the other hand, allows the Michtim to weep to reduce incoming damage. Michtims rely on these three things. There are several magical Callings that provide for spellcasting in the fiction, like the Sorcerer or Witch. 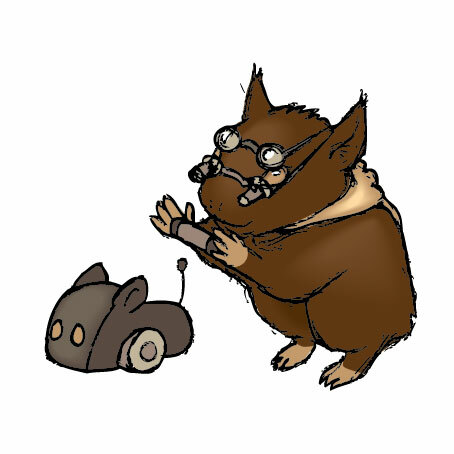 Technology is also a viable path to power for Machinists and Cybertooths. All Michtims have the ability to speak with animals, so Nature is a strong ally to all Michtims. Players can take any Calling and change its meaning in the fiction, by providing new themes for existing mechanics. 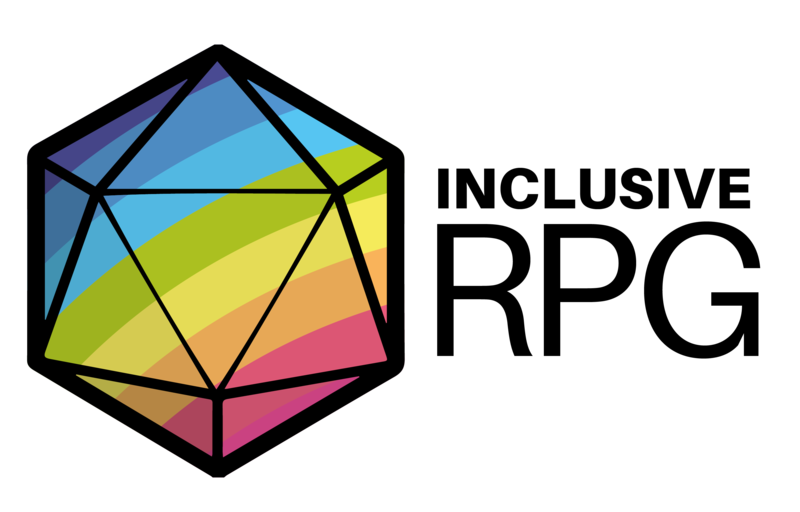 The art, game design, graphic design and writing were all created by Georg Mir, and are thus guided by a single vision: to create a game that will be a welcoming place to all kinds of people, no matter their gender, sexual orientation or ethnic background. The game is available as premium color hardcover from DriveThruRPG/RPGNow. The paper is of high quality and quite robust, and the colors are very rich. The game is tightly packed with content, while being slim enough to carry it around with ease. If you buy the hardcover book, you will receive the PDF for free, so you can instantly check out the game while waiting for the delivery. The game offers dedicated gaming materials that provide helpful rule information to all players. 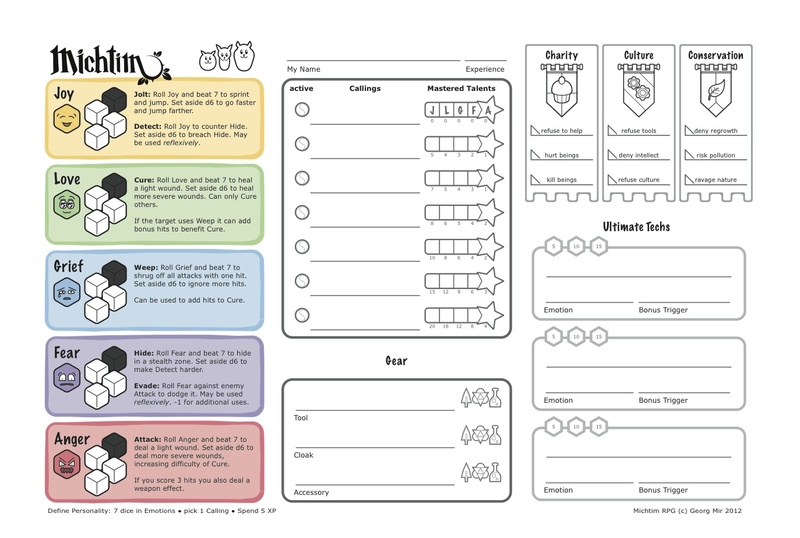 The character sheet has all the basic actions on it, while the Calling rules are provided in a card-based format, so players will only need to keep their relevant rules. 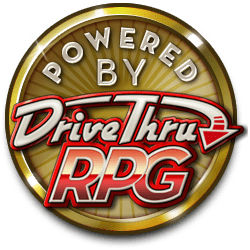 As added benefit this means you can freely check out most of the game rules by downloading these free products from the store. ‹Delightful, inviting and cute are all ways to describe Michtim Fluffy Adventures. A fantastic example of gameplay mechanics leading to an immersive roleplay experience.› - Shawn G.
Imagine a cartoon show starring you and your fuzzy gang, in fervid episodes to save your beloved magical kingdom from the machinations of humanity. You will take your finest Glidewing cloaks and most trusted Tome of Frost to blast away at your enemies with the power of your Anger. You will build mechanical support drones to Cure your friends from afar. You will define trigger conditions to ward your friends with the power of your Grief. Innovative game mechanics to keep the action rolling with ease. Uses Personality traits to define the abilities of the hero. Your character's mood influences their chances of success! Comes with 12 Callings, each offering unique game mechanics to mesh with your basic actions. Uncover the most useful combinations! Kid friendly setting, teaching values about life: Charity, Civilisation and Conservancy. Welcoming atmosphere, meant to be inclusive to players of all creeds. 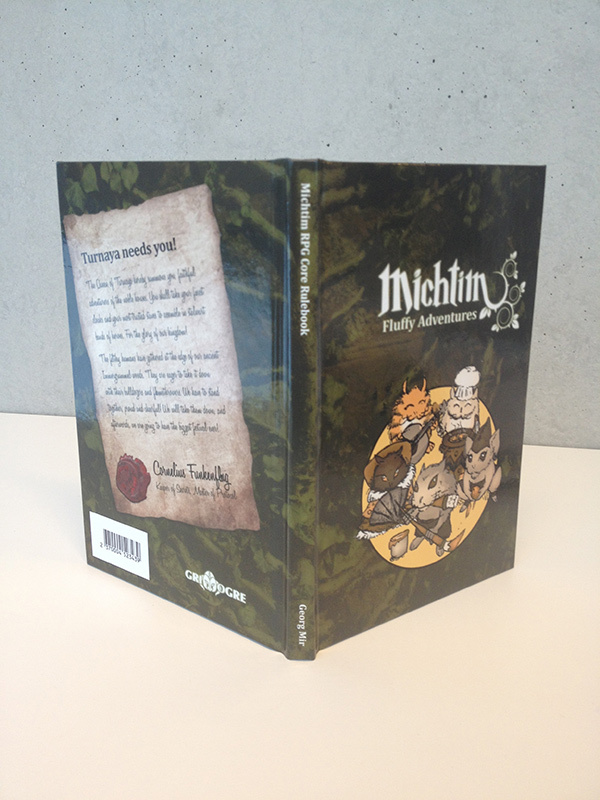 Michtim is a tumultuous adventure of small, furry heroes struggling against the depredations of humanity. The Michtims live in a giant tree kingdom, hidden in the Immergrummelwoods by the magical powers of the Veil. The Veil is powered by the folk rites of humanity, like putting a saucer of milk outside for the fae. But humanity's belief is dwindling, substituted by greed and callousness. Michtims cannot tolerate this, and will go to lengths to sabotage animal factories and intervene with the long-legs' plans to raze the woods, just to build another shopping center. Michtims have an elaborate culture, centered around three noble houses. Each of those houses has different values, called Virtues. While Haus Barsik promotes Conservancy, Haus Grauling seeks Civilisation and its trappings, and Haus Turnaya follows Charity to craft a strong society. Michtim heroes are a diverse lot. Their Personality has a direct influence on their abilities. Angry Michtims are fierce fighters, while caring heroes are healing their gang members. These basic abilities are further enhanced by twelve Callings; magical or technical archetypes that refine the core game mechancis. Sorcerers can sacrifice dice to affect targets at range, while Cooks can set aside dice to create food power-ups. Best of all, every Calling works with every combination of Personality traits. The game features unique and novel rules that are both easy to remember (and part of the character sheet as well), but offers tactical depth to those that are willing to combine Callings, utilize Gear and develop personal Ultimate maneuvers. Designer's Note: The setting also takes a strong stance on the notion of equality. Whether you're female, male or intersex; whatever type of love you might live, Michtim culture is a happy place without sexism, racism, trans- or homophobia. 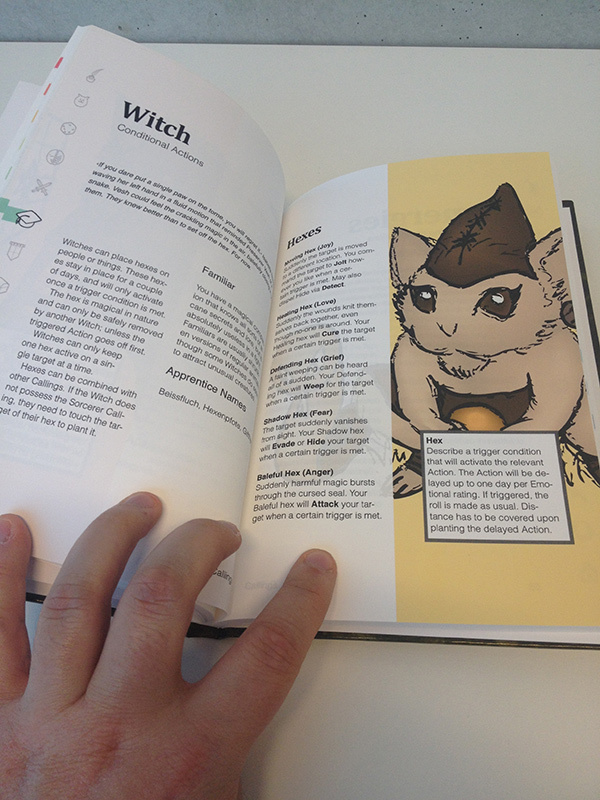 You can also use the Flash Preview to look inside the book, from cover to back! Hope you like what you see. Be sure to check out the Character Sheet too! It has all the basic action rules on it, for ease of reference. You will find a free copy of the Calling Cards too. These will come in handy once you acquire your first Callings (like Frostpaw, Witch or Bard), because they offer all the rules on small cheat cards. I'm curious how opposed rolls work, like combat. Hey there. I hope I can help. 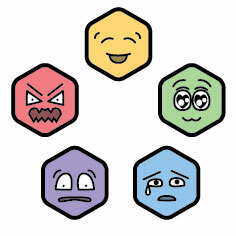 There are five Emotions in the game, each featuring a different opportunity to interact with the world. You can check out the Emotions and their rules on the freely available character sheet. You can use Anger to attack someone. You need to roll a total of 7 or above to make one hit (1 damage). If you have a high rating, you can decide to roll fewer dice, and in exchange for the higher risk, you will deal increased damage (or effect, in other cases). Your enemy, however, could decide to use their Fear to evade. If they do so, suddenly, your target number isn't 7 anymore, but is replaced with the enemy's total of the Fear roll (like 12 or whatever). In this case, it is important for you to don't play risky, but instead roll many dice and inflict smaller wounds, but at least be able to land them. There is another way to resist damage tho: your enemy can forego their action to use Grief and Weep and plead you to stop. This is an action that creates...See more a sort of "shield" that reduces all incoming damage by 1 (or higher, if they set aside dice - again: higher risk, higher reward). There are a lot of different interactions in the game that are predefined. Like you can use Fear to hide, and counter it with Joy (Detect). Again, using risk/reward mechanics to either play it safe or go for increased effect. It's an open system. You can tinker with it. There's a small section on game design as well, and I think I created a good foundation to hack the system for your own homebrew settings and games. This title was added to our catalog on August 31, 2012.